Federalism is a distinct feature of the U.S. Constitution. Federalism is the system of co-sovereignty current in the United States, and various other nations such that a national or federal government shares power along with state governments over the same territory and citizenry. More specifically, federalism involves dual sovereignty, or the allocation of power between the federal government and the states under the U.S. Constitution, with overlapping authority. In the United States the states "surrendered many of their powers to the new Federal Government," but retained "'a residuary and inviolable sovereignty.'" This dual sovereignty is "reflected throughout the Constitution's text." The continued existence of state sovereignty is "implicit . . . in the Constitution's conferral upon Congress of not all governmental powers, but only discrete, enumerated ones." Federalism is determining which powers and duties belong at the federal level and which belong at the state level. Under the Articles of Confederation, the states had most powers, and the Constitution was drafted with the purpose of granting the federal government additional powers. These powers are clearly identified under the Enumerated powers of Article I. Under the Constitution, individual issues would be framed in terms of states' powers vs. the proper role of the federal government. From 1800 until 1860, this debate was mostly viewed from the perspective of slavery vs. abolition of slavery. Beginning in the 1900s, the federalism debate has been viewed through a progressive vs. conservative perspective. In the 1930s, progressives re-labeled themselves, so the debate became liberal vs. conservative. At the Constitutional Convention, Federalism developed into a part of the solution to the perceived failures of the Articles of Confederation. Events such as Shays' Rebellion strengthened the view that the Articles were insufficient over a long period of time. Early Supreme Court cases have reflected this retained sovereignty by the states: Chisholm v. Georgia, Ware v. Hylton, Worcester v. Georgia, and Martin v. Hunter's Lessee. Starting in the Progressive Era after the passage of the Sixteenth Amendment, federal Grant-in-aid programs began to be used to undermine the dual sovereignty of America and drive the country in a more National direction. Justice Kennedy, who as of 1997 was the pivotal fifth or "swing" vote on the U.S. Supreme Court, has also embraced federalism. "[F]ederalism was the unique contribution of the Framers to political science and political theory. Though on the surface the idea may seem counter-intuitive, it was the insight of the Framers that freedom was enhanced by the creation of two governments, not one." Since that ruling, there have been many decisions by the Supreme Court and lower courts limiting federal power to interfere with state sovereignty in fields of traditional state control. For example, The Fifth Circuit held that "[w]here Congress aims to change the usual constitutional balance between the states and the federal government, it must make unmistakably clear its intention to do so in the statute’s language." Premiere Network Servs. v. SBC Comm., 440 F.3d 683, 690 n.8 (5th Cir. 2006) (citing Will v. Michigan Dep't of State Police, 491 U.S. 58, 65 (1989) and Gonzales v. Oregon, 546 U.S. 243 (2006), emphasis added). ↑ Printz v. United States, 521 U.S.98, 918-19 (quoting The Federalist, No. 39, at 245, James Madison). ↑ "The authority to make war, of necessity implies the power to make peace; or the war must be perpetual. I entertain this general idea, that the several States retained all internal sovereignty; and that Congress properly possessed the great rights of external sovereignty"
↑ "	Within the sphere allotted to them, the co-ordinate branches of the general government revolve, unobstructed by any legitimate exercise of power by the state governments. The powers exclusively given to the federal government are limitations upon the state authorities. But, with the exception of these limitations, the states are supreme; and their sovereignty can be no more invaded by the action of the general government, than the action of the state governments in arrest or obstruct the course of the national power." 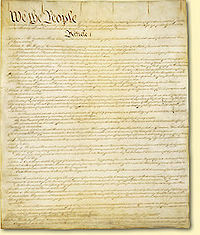 ↑ "The constitution was not, therefore, necessarily carved out of existing state sovereignties, nor a surrender of powers already existing in state institutions, for the powers of the states depend upon their own constitutions; and the people of every state had the right to modify and restrain them, according to their own views of the policy or principle. On the other hand, it is perfectly clear that the sovereign powers vested in the state governments, by their respective constitutions, remained unaltered and unimpaired, except so far as they were granted to the government of the United States." This page was last modified on 10 December 2018, at 22:53. This page has been accessed 28,742 times.